17098	EX 22 Nov 1939 : Paul Brown. Boy with Thanksgiving turkeys. 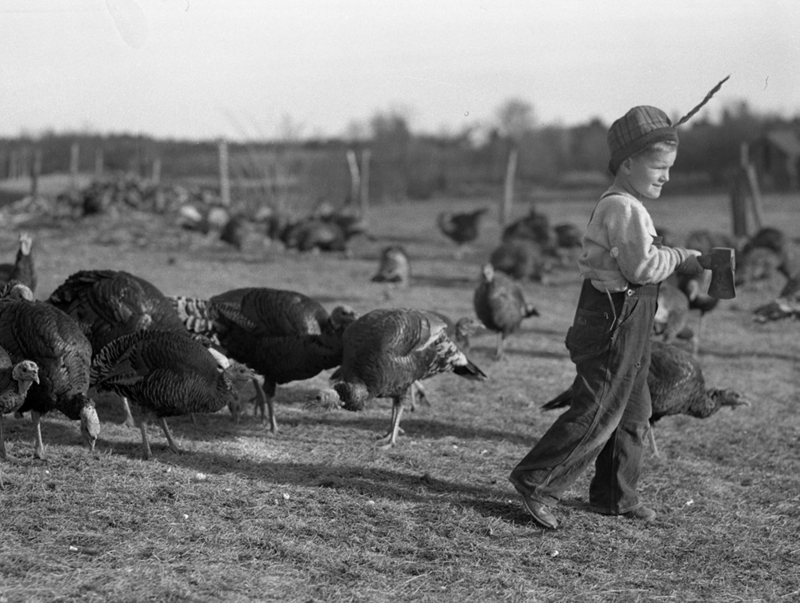 1939: Four-year-old Paul Brown, son of Deputy Sheriff Edward M. Brown of West Falmouth, carries a man’s-size axe among the turkeys on the farm of his neighbor and friend F. E. Shaw. 1939: Four-year-old Paul Brown, son of Deputy Sheriff Edward M. Brown of West Falmouth, isn’t sure whether Thanksgiving is this Thursday or the following one but he is certain of a turkey dinner. Paul, after giving his man’s-size axe a keen blade, stalked after a fat turkey on the farm of his neighbor and friend F. E. Shaw, caught up with the bird and took him to the chopping block. Then there were a few feathers to pluck and Paul had himself the makings of a Thanksgiving feast.